Some of these items take the form of reviews of books. Some might not. Hence the "etc." The reviews of books should include sufficient bibliographic information for you to request the book from your public library or (if you have such financial resources) to buy it from an independent bookstore or directly from the publisher. 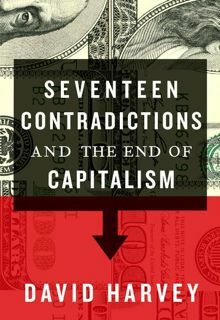 Seventeen Contradictions and the End of Capitalism, David Harvey, 2014, Oxford University Press, ISBN 978-0-19-936026-0 (hardback), ‹https://global.oup.com/academic/product/seventeen-contradictions-and-the-end-of-capitalism-9780199360260›. 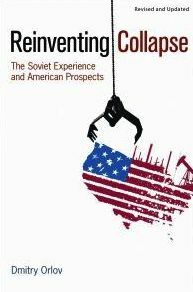 Reinventing Collapse: The Soviet Experience and American Prospects, Dmitry Orlov, 2011, New Society Publishers, ISBN 978-0-86571-685-8 (paperback), ‹http://www.newsociety.com/Books/R/Reinventing-Collapse›. 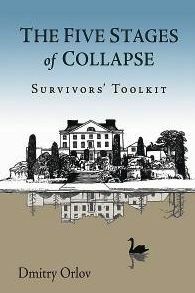 The Five Stages of Collapse: Survivors' Toolkit, Dmitry Orlov, 2013, New Society Publishers, ISBN 978-0-86571-736-7 (paperback), ‹http://www.newsociety.com/Books/F/The-Five-Stages-of-Collapse›. These three fine books by two quite different authors address the future of capitalism. Probably to the surprise of nobody reading this review, they predict it will come to no good. The authors approach their topic from remarkably different backgrounds, use different methods of analysis and argument, address different audiences, and wish for different outcomes. Yet their books work well together, complementing gaps in the other's argument. Dmitry Orlov lived in the Soviet Union until his emigrating family brought him to the United States as a teenager. During and since the collapse of the Soviet system, he visited the land of his origin repeatedly. He blogs weekly at ‹http://www.cluborlov.com›. He appears to write for a popular audience that includes people with a survivalist "prepper" inclination. New Society Publishers, which offers these two books by Orlov, has a leftish/progressive history but Orlov has no obvious allegiance on the left-right spectrum. He takes more of a plague-on-both-your-houses attitude. Orlov's background in technical fields shows in his method of argument. He especially likes to lay out a step-by-step progression that leads to a conclusion with a sense of inevitability. His explanation of the results of compounding interest (pages 21-24 in The Five Stages of Collapse) illustrates this inclination. That example also features the wry humor that enlivens his arguments. That irreverent cheerfulness can also distract the reader from thinking carefully about Orlov's assumptions, the relevance of his evidence, and the generality of his anecdotes. David Harvey has written more than a dozen Marxist books since the early 1980s. He serves as Distinguished Professor of Anthropology at the Graduate Center of the City University of New York. This book appears under the imprint of Oxford University Press, one of the more prestigious academic publishers. In addition to his prolific book production, Harvey offers an excellent series of video lectures on Marx's Capital (and other topics) at ‹http://davidharvey.org/›. While Orlov attempts to find a position outside the left-right spectrum, Harvey stands proudly and cheerfully on the left. He writes in a style most suited for his peers on that side of the political range among Western faculty members. However, as his video lectures vividly demonstrate, he wishes to communicate to a wider circle while maintaining the intellectual rigor that academic work encourages. Harvey, like Orlov, enlivens his writing with a playful sense of humor -- though rather more droll, less frequent, and less forced. In Reinventing Collapse, Orlov asserts that the economy of the United States will collapse. It will collapse in a messier way than the Soviet Union did because the United States lacks the customs and infrastructure that helped the people of the Soviet Union survive the collapse of their economy. We in the United States have a much bigger task in preparing to survive the coming relatively sudden loss of the economy that supports us. Orlov then offers a chapter on each stage in which he explains the causes, describes the effects on daily life, offers tips for how to function during that stage, and presents a short case study of a past society in that stage. In Seventeen Contradictions, Harvey catalogs and carefully describes seventeen internal contradictions affecting capital's development. They range from contradiction 1 between use value and exchange value to contradiction 17 between the needs and desires of human beings and the inherent requirements of an economy based on capital. Understanding each of these contradictions can help us understand --by examining the shifting balances between the two sides of each contradiction and the shifting prominence within society among the seventeen contradictions-- potentials for freeing ourselves from capitalism. Harvey and Orlov describe an economic system that, worse than merely threatening some ultimate failure, directly harms most of those who live within it. Orlov focuses on near-future risks. Harvey focuses more on theoretical unworkableness and on current harm. Orlov recommends individualistic preparation for survival and escape. He envisions small extended-family groupings that mostly provide their own material and social needs. Harvey concentrates on a careful logical analysis of the theoretical implications of capital. His recommendations remain similarly logical and abstract. Both Orlov and Harvey lack imagination for the possibilities beyond capitalism. Even after spending most of their books describing convincingly why the current system cannot continue indefinitely, they both assume the foundation of the current economic system will continue. Orlov assumes the post-collapse economy will rely on property rights and will, at least partially, grow back from rudimentary, local forms of exchange such as barter and tribute. Harvey, to the extent that he comments at all about a post-capital economy, seems to assume some form of (probably state-based) production for exchange. He envisions jobs that, while more humane in unspecified ways, still apparently consist of wage labor. Such lack of imagination in mostly clear thinkers and excellent writers disappoints at least this reader. If we knock back the financial superstructure of capital, make jobs better paid and healthier, focus production on actual human needs instead of the most profitable kinds of trash, and require production and distribution to use ecologically sustainable methods, we would accomplish a major improvement in human lives. Temporarily. The inherent logic of property and exchange, however, will drive them to expand and to seek to conquer more and more of our lives and of the physical world. Within a short period of time, the new economy would begin to resemble the old economy. No, we must dare to imagine and to insist upon a more thorough transformation. We must put a final end to property and to exchange. Only then will we have a chance to develop a human economy that serves us all. We must base our economy not on property and exchange but on work and shared use. In that economy nothing will have an exchange value, because we will not trade anything. Those of us who have the ability and inclination will work and produce. We will make the fruits of our labor freely available to any who wish to use them. We will use whatever we need and find in the storehouses. We will discuss and come to agreements on what to produce. For work that nobody wants to do but we agree that we need, we will take turns. We will constantly figure out the details as we encounter them. Easier said than done, of course. But saying we intend that change seems a useful early step toward the doing. That Orlov and Harvey didn't call for that change probably shouldn't count against them. Neither declared their book would outline a desirable economy. These books have rather smaller goals. Orlov seeks to help individuals, especially residents of the United States, think about how economies collapse and about how to prepare for their economy's collapse. Harvey seeks to catalog and explain the contradictions inherent in capital. Judged by their own goals, they succeed quite well. Judged against the larger goal of creating the world we all deserve, these books make modestly useful contributions. In response to which, we can only thank the authors and seek to make our own modestly useful contributions. 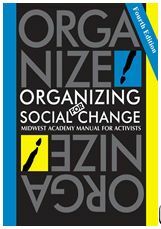 Organizing for social change: Midwest Academy manual for activists, 4th edition. Kim Bobo, Jackie Kendall, and Steve Max. 2010. The Forum Press. ISBN 978-09842752-1-2. ‹http://www.organizingforsocialchange.com/index.html›. Doing democracy: the MAP model for organizing social movements. Bill Moyer, JoAnn McAllister, Mary Lou Finley, and Steven Soifer. 2001. New Society Publishers. ISBN 0-086571-418-5. ‹http://www.newsociety.com/Books/D/Doing-Democracy›. Toward a living revolution. George Lakey. 2012. Peace News Press. ISBN 978-0-946409-16-7. ‹http://peacenews.info/node/6887/toward-living-revolution-five-stage-framework-creating-radical-social-change›. In the United States, most easily ordered from Training for Change at ‹http://www.trainingforchange.org/publications/towards-living-revolution-five-stage-framework-creating-radical-social-change›. Strategies can take many different forms, depending on the goals people seek to win using them and the circumstances in which those people use them. The size of the changes we want to win affects the kind of strategy we will need to win them. Smaller goals will usually need different kinds of strategies than will bigger goals. We can imagine a line that represents the different sizes of goals, ranging from the smallest goal on one end and the largest on the other. Getting your city to repair broken streetlights in the poor section of town might go near the smaller end of the line. Replacing capitalism with a more humane economic system might go near the larger end of the line. At least three strategic frameworks exist to help us think about how to develop our strategy. In the United States, one of the most widely known strategic frameworks comes from the Midwest Academy ‹http://www.midwestacademy.com›. You can find a good explanation of their thinking in the book Organizing for social change by Kim Bobo, Jackie Kendall, and Steve Max. A third strategic framework comes from George Lakey, a long-time trainer, founder of Training for Change ‹http://www.trainingforchange.org›, and activist in many sectors of movement work in the United States and elsewhere. His book Toward a living revolution explains this framework. These three strategic frameworks cover different (but partially overlapping) portions of the range of different sizes of goals. Let's compare these three strategic frameworks by the type of changes they seek to win and the geographic scales and time scales on which they operate. We'll also list an example or two for each. We'll take our examples from the environmental movement in the United States, but examples exist in many other kinds of movements and throughout the world. First, what kind of change do you want to make? Midwest Academy assumes you can identify what they call the "target", a person or institution that can give you what you want. This framework helps you design strategies to persuade or pressure them to do it. This framework generally does not challenge their right to make the decision; it presses them to make the decision you want. For example, the Midwest Academy framework might help you plan a strategy to get an electric utility company (the "target") to clean up a coal ash disposal pond that threatens a nearby town. Bill Moyer's Movement Action Plan (MAP) offers a strategic framework for rather larger goals. MAP helps you design strategies to win relatively large reforms in a society. These reforms often result in shifting the balance of power for elements of the society. They generally do not challenge the fundamental structure of the society. For example, MAP applies very well to the movement in the 1960s and 1970s that stopped the construction of nuclear power plants in the United States for decades. 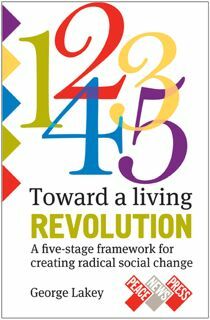 George Lakey's book Toward a living revolution offers a strategic framework for the largest goals of social movements. Goals on this scale often earn the label "revolution." They create systemic shifts in power that alter basic social structures. In the United States most environmental groups have not yet attempted to win goals on this scale. Environmentalists might want to use this framework if they decide to replace capitalism with an economic system that does not require constant growth and does not require externalizing costs onto the environment and onto workers. On geographic scales, the Midwest Academy framework usually operates relatively locally: a city, county, or workplace, rarely larger. MAP generally operates on large geographic scales, usually country-wide though sometimes on a smaller region. Toward a living revolution assumes society-wide geographic scales, usually a country or larger. Likewise, the time spans of the strategies based on these three frameworks vary similarly. Midwest Academy campaigns usually take weeks to years. MAP strategies usually take several years, though sometimes less. Strategies based on the framework in Toward a living revolution will take at least several years and likely decades or more. Notice something else about these three strategic frameworks. They do not have sharp, clear edges. Instead they overlap and blend into each other at their edges. Furthermore, strategies developed within the larger-scale frameworks will often include sub-strategies developed within the smaller-scale frameworks. So even if you think your goals mostly fit within one of the three frameworks, a smart strategist will want to have a basic familiarity with all three strategic frameworks. 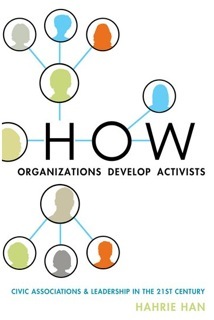 How Organizations Develop Activists: civic associations and leadership in the 21st century, Hahrie Han, 2014, Oxford University Press, ISBN 978-0-19-933677-7 (paperback), ‹https://global.oup.com/academic/product/how-organizations-develop-activists-9780199336777› . When I mentioned the title of How Organizations Develop Activists to a colleague, she asked with surprise in her voice, "Do organizations develop activists?" Some do. Many don't. In this book, Hahrie Han, associate professor of political science at Wellesley College, presents the results of her research into the practices that result in those different outcomes. In her clever research design, Han examined pairs of local units of two nationwide activist organizations in the United States. She paired "high-engagement" chapters (chapters "particularly strong at mobilizing members") with "low-engagement" chapters in pairings "selected to minimize demographic, political, and civic differences between the two communities." She studied three such pairs in each of the two organizations, using surveys, interviews, and observation. The organizations also gave her access to internal data on their members' participation. In spite of these concerns, Han's findings generally seem plausible to this long-time organizer and observer of organizations. Han categorizes participants in the organizations into four steps on an "activist ladder" (pages 33-37). The first level includes those people who join the organization. Committing discrete amounts of time moves someone to the second level. "This might involve showing up for meetings, participating in a phone bank, signing an online petition, tweeting information through social media, or participating in another activity that does not require the volunteer to take on any responsibility." (35) Han calls people at this second level and above "activists." To get to the third level in Han's terminology, activists "commit whatever time it takes to achieve an outcome for which they are responsible. This might involve getting 50 people to show up to an event, getting 100 signatures on a petition, or even shepherding a piece of legislation through the legislature." (35) Activists at this level and above she calls "leaders." Too many of our organizations merely try to inform, exhort, and mobilize. If they would restrain a bit the urge to exhort and instead invest in the long-term work of organizing, they --and our movement as a whole-- would gain strength. To the extent this book helps prompt that change it makes an urgently valuable contribution. Page 35, line 18, change "leader" to "ladder". Page 62, line 7 from the bottom, insert "important" after "Particularly". Page 88, line 11, change "is engage" to "is to engage". Page 121, line 11, change "do have voice" to "do to have a voice". Page 123, line 9, change "can they lay" to "can then lay". Page 155, line 6 from bottom, change "belies" to "reveals". I hope the publisher will correct these small mistakes in the next edition. If a good number of organizations and organizers buy this book, that should increase the chances of a new edition and continued availability. Given the importance of this book's topic and the usefulness of the author's analysis, I hope many leaders of our movement's organizations will learn from it. The Contradictions of "Real Socialism"
The Contradictions of "Real Socialism": the conductor and the conducted, Michael A. Lebowitz, 2012, Monthly Review Press, ISBN 978-1-58367-256-3 (paperback), ‹http://monthlyreview.org/press/books/pb2563/› . Interesting questions. Especially to those of us who want to construct a more humane system than the capitalism that defeated the USSR. Lebowitz offers interesting answers. First, he discusses (in chapter 1, especially pages 33-36) the method he thinks we should use to examine such questions. He describes this method as Marx's dialectical approach. I don't claim sufficient expertise in Marxism to evaluate how well his method matches Marx's. But it at least relies upon facts and repeatedly raises illuminating questions. I count those as two good things in an analytical method. He begins his analysis (on page 36) by focussing on "an obvious surface phenomenon -- chronic shortage." What effects resulted from constant shortages of consumer goods and inputs for producers? How did individuals and institutions cope with shortages? What results did those coping mechanisms have? Writing in a highly fluid (though sometimes a bit repetitive) style and with an intense focus on particulars from which he abstracts to generalities, Lebowitz repeatedly iterates through the steps of his analytical cycle: Notice a particular fact. Examine its implications. Generalize from them. Encounter a contradiction. Take that as a particular and repeat the process. SPOILER ALERT: If you want to experience the suspense of following his examinations, skip the rest of this mini-review. With fascinating examples and clever arguments full of many valuable points beyond the scope of this mini-review, Lebowitz concludes that the Soviet system created internal dynamics that resulted in two fatal flaws. Those dynamics concealed necessary information from the central planners. They also created a working class accustomed to passivity and alienated from the system that supposedly served it. What aspect of the system caused these undesirable results? Lebowitz blames what he calls "vanguardism", the mistake of creating a party to act on behalf of the working class instead of invigorating workers to act on their own joint initiatives and in their own shared interests. Lebowitz does not drop this conclusion on us from the sky. He leads us to it step by step through his careful Marxist analysis. Many others, anarchists in particular, have come to a similar conclusion by other routes. At the end of the book, Lebowitz remains solidly Marxist. Mildly statist also, at least for a transition period. He eloquently, vividly, and thoroughly nails the coffin lid on vanguardism, however, for which Marxists and anarchists both should thank him. Vanguard Marxism comes in different varieties. There are those in power for whom it serves as theoretical justification of their position. There are also those far from power who accept the theory but whose main criticism of Real Socialism has been that it was the wrong vanguard in power. The latter group may be critical of the lack of workplace democracy and the evils of an ill-defined "bureaucracy," but as long as they embrace the theory of a conductor without whom the music of the future will never be realized they do not offer a real alternative. As long as their politics do not make the "key link" central to both theory and practice, that is, as long as they do not understand the importance of the simultaneous changing of circumstances and human activity or self-change, it is all more of the same. How to do that remains for us to discover, presumably by trying whatever looks best to us, just as did those who fell into the error of vanguardism and didn't get out of it in time. A careful understanding of this book, however, should help prevent repeating that mistake. A New New Deal: how regional activism will reshape the American labor movement, Amy B. Dean and David B. Reynolds, 2009, Cornell University Press, ISBN 978-0-8014-4838-6, ‹http://www.cornellpress.cornell.edu/book/?GCOI=80140100697040› . Contrary to the book's misleading main title (which suggests that it focuses on federal policy), the book urges labor unions in the United States to convene and lead broad coalitions to build local power in regions centered on cities. The policy work gets focused through "think-and-act tanks" that do research, develop policy goals, and monitor government agencies. "These organizations develop and propagate a broad vision of what's wrong and what to do about it." (p.11) They do so "in constant interaction with the grassroots labor and community organizations these policies are intended to serve --and whose action is necessary to implement them." (p.12) They also foster the coalitions. "[P]olitical power building involves far more than just endorsing candidates and getting out the vote. It involves educating candidates about the labor movement and the needs and goals of working people." (p.13) It also means recruiting and training champions to support the people's agenda. It means getting these champions appointed to governmental positions and elected to offices. Then it means supporting them in implementing the agreed-upon people's agenda. Though several localities across the country have implemented approximations of this regional powerbuilding strategy, it requires a significant shift from the focus that many unions have on solely serving their current members. That shift, however, offers the chance to build a broad-based movement that can gain sufficient power to serve all their members and the whole local working class better than any organization could serve their members in isolation. The authors focus exclusively on the United States. Their analysis appears to ignore the global economy. Given that they seem to write primarily for current leaders of U.S. unions, they may have chosen that focus wisely. Their analysis and rhetoric will generally seem acceptable to many mainstream union leaders in this country. Acceptability, however, does not guarantee correctness. This book's analysis needs the broader (and somewhat deeper) insights available from, for example, Solidarity Divided. Solidarity Divided, on the other hand, needs the very practical advice offered by A New New Deal on how to build serious local power. At least one local powerbuilding project in the United States reports that they have based their work on a study of both books. Union and allied activists will benefit from reading and discussing this book. We will also gain strength from implementing many of its recommendations. this PDF opens in new window, 127kbcheatsheet offers a ten-page ultra-condensation of the book. Waging Nonviolent Struggle: 20th century practice and 21st century potential, Gene Sharp, 2005, 598 pages, ISBN 978-0-87558-162-0. Power and Struggle, Part One (pages 1-105) of The Politics of Nonviolent Action, Gene Sharp, 1973, ISBN 978-0-87558-070-8. The Methods of Nonviolent Action, Part Two (pages 109-445) of The Politics of Nonviolent Action, Gene Sharp, 1973, ISBN 978-0-87558-071-5. The Dynamics of Nonviolent Action, Part Three (pages 449-902) of The Politics of Nonviolent Action, Gene Sharp, 1973, ISBN 0-87558-072-6. All four books published by Extending Horizons Books ‹www.extendinghorizons.com›, an imprint of Porter Sargent Publishers, Inc. Some people describe those of us who advocate nonviolent action as naive dreamers unconnected to the gritty real world. Gene Sharp's books with their pragmatic focus based on actual real-world examples show some of us don't deserve that naive label. Some advocates of nonviolence, however, dislike Sharp's pragmatism. Some of those motivated by religious beliefs fail to understand that other motives can sustain nonviolent discipline. Gandhi and King, though they both had long-term allies who did not share their religious motives, sometimes wrote as if they thought only religion could reliably motivate nonviolence. Those who think that underestimate their fellow humans, as many of Sharp's historical examples demonstrate. My understanding of the requirements for effective anti-dictatorship struggles arose not only from anti-Nazi resistance movements, but also from meeting with Burmese opposition groups on the Thai-Burmese border areas and in Thailand in the 1990s. I met with Panamanian democrats protesting against Noriega in 1987. I met with students and opposition leaders in Beijing in parts of May and June 1989, and was in Tiananmen Square as the troops first entered. I also met with ministers of the independence-minded governments of Latvia, Estonia, and Lithuania as they were struggling to secede from the Soviet Union in 1991. Brutal political reality can focus the mind on the difficulties of applying nonviolent struggle against extreme dictatorships. One thing that is clear from these experiences is that nonviolent struggle has operated in situations of much violence and often in struggles where at least some of the nonviolent resisters had great faith in the power and necessity of violence, although they still chose and effectively used nonviolent struggle. It is also clear that nonviolent struggle is an important part of political reality. It has often been belittled or ignored by persons, movements, or governments that "know" that the "real" power derives from violence. However, nonviolent struggle is another very powerful form of force. Waging Nonviolent Struggle, Sharp's newer compendium, appeared in 2005. It revisits some examples from the 1973 volumes. It also adds major new sections on strategic planning for nonviolent struggle. In what order should a beginner read them? First, get all four books, flip through them to see what awaits you, and skim any bits that particularly catch your interest. Read Power and Struggle (part one of the 1973 trilogy), then Waging Nonviolent Struggle, then parts two and three of the trilogy (skimming some of the numerous examples from history and topics well covered by Waging Nonviolent Struggle). Why read part one of the 1973 trilogy first? Because in its first half (just under 50 pages), it comprehensively explains the source of political power -- not just the source of the power of nonviolent action, but the source of all political power. Political power comes from cooperation. Rulers can seek to gain willing cooperation or to compel unwilling cooperation, but if they don't get sufficient cooperation of some form they don't rule. People can choose whether to cooperate or not. They can withdraw their cooperation from oppressors and cooperate instead with formations that suit them better. With appropriate organizing, they can sustain those choices in spite of severe attempts to repress them. They can also often win. The quick-reading 100 pages of Part One of the 1973 trilogy states that fundamental principle of nonviolent action clearly and directly. The hundreds of pages in the other volumes give us careful details on how to implement that principle, illustrated by numerous examples from history. The more of us who learn and use these techniques, the more we can cooperate to create our own examples and make our own history. 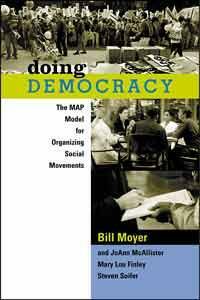 Doing Democracy: the MAP model for organizing social movements, Bill Moyer, JoAnn McAlllister, Mary Lou Finley, and Steven Soifer, 2001, New Society Publishers, ISBN 9780865714182, ‹http://www.newsociety.com/Books/D/Doing-Democracy› . A basic manual for those of us working to guide society. Get it, read it, use it, tell other organizers about it. This book presents the Movement Action Plan (MAP), a model for how people-power movements succeed in creating social change. It outlines the four roles (preferred ways of working for social change) of activists. It sketches how activists serve in each role effectively and ineffectively (sometimes even counterproductively). It explains the tensions among people who prefer different roles. It demonstrates why successful movements welcome all four roles when done effectively. It points out that some organizations and individuals specialize in specific roles but the movement as a whole needs all four. Even if this book only explained this dynamic around the four roles of activists, it would serve us well. If all of us understood this dynamic, our coalitions and movements would function much better. But the strategic insights keep coming. First, to recognize that a problem exists that deserves social attention. Second, to oppose current conditions and policies supported by society's powerholders. Third, to want (and no longer fear) the solutions advocated by the movement. Movements win the public to these three views at different times as they develop through the eight stages of movement success. The tasks the movement must focus on vary from stage to stage (as do the tactics the powerholders will tend to use in opposing our movements). Accordingly, different activist roles have different degrees of prominence in the different stages. This book offers a model. Its model simplifies matters by omitting many real-world complexities. As do all useful models. That simplification makes models useful because it helps us think about the overall structure of complex processes. As long as we use models to help us think about the real world and not attempt to follow them unthinkingly, they can serve us well. Understanding the MAP model of social change can help organizers understand where we've gotten to in the process, why we have the particular opportunities and problems we have at this stage, and what we need to do to move forward. Doing Democracy explains the MAP model in the first half of the book. The second half illustrates the model by applying it to five movements in the United States: civil rights, anti-nuclear energy, gay and lesbian rights, breast cancer, and anti-globalization. Organizers leading all sectors of our broad movement will find this book helpful. I also discuss Doing Democracy in a more recent review above of Three frameworks for strategy. Solidarity Divided: the crisis in organized labor and a new path toward social justice, Bill Fletcher Jr. and Fernando Gapasin, 2008, University of California Press, ISBN 978-0-520-25525-8, ‹http://www.ucpress.edu/book.php?isbn=9780520261563› . The authors briefly sketch the history of trade unions in the United States and then use a detailed examination of the Change to Win (CTW) split from the AFL-CIO in 2005 to diagnose the current difficulties of organized labor in this country and offer their prescriptions of what to do about them. The authors' diagnosis: U.S. unions took a wrong course when they adopted Gomperism (a form of business unionism that emphasizes service to members within an acceptance of capitalism and support for the international policies of the U.S. government). Their prescription: U.S. unions must convert to social justice unionism. Unions must see themselves as part of an international social justice movement that serves the interests of the worldwide working class. They should organize multi-constituency blocs to take power in cities rather than just organize workplaces or industries. Central Labor Councils offer a prime vehicle for building social justice unionism. This book deserves widespread discussion. Fortunately, recent experience shows that many union activists and non-union social justice activists find its topics quite interesting. Given a convenient opportunity, they gladly engage in lively discussions with each other over this book. In late 2010 and early 2011, I led two six-session discussion groups on this book. If you would like to lead discussion of this book, this PDF opens in new window,106kbset of questions (requires Adobe Acrobat. For free download of Adobe Acrobat, visit Adobe.) includes many of the ones I used to prompt discussion in our groups. this PDF opens in new window,111kbcheatsheet offers a nine-page ultra-condensation of the book.